School’s in! Too early for many this year when classroom doors swung open in late August as temps soared then, and still do. Ahh, those dog days of summer! Labor Day marks the perfect getaway weekend to complete a fun season. Before you know it, a crisp red-orange autumn palette will dazzle. Shorter days bring cooler temps and serve as a precursor to the holiday festivities that inevitably creep up on us. Our office moved at the end of last year to the Neptune Building in the Arts District on Third Street, on the northern perimeter of Little Tokyo. The scene has a younger vibe, lots of loft dwellers, SCI-Arc students, artists and designers, who drop into local small restos and fill the streets walking their dogs and riding bikes. The new kid on the block reminds me of an expanded museum gift shop geared towards 20- to 40-somethings. And it’s just a stone’s throw from us on Third. Poketo is its name! A husband-and-wife team, Ted Vadakan and Angie Myung, have created an environment that melds well into this area. With backgrounds in art, design and filmmaking, they’re able to collaborate with hundreds of international artists to add to their retail and online store (poketo.com) mix. Art for your everyday is their premise. T-shirts, backpacks, stationery, jewelry, purses, wallets, kitchen things plus a potpourri of gadgets are tastefully affordable. 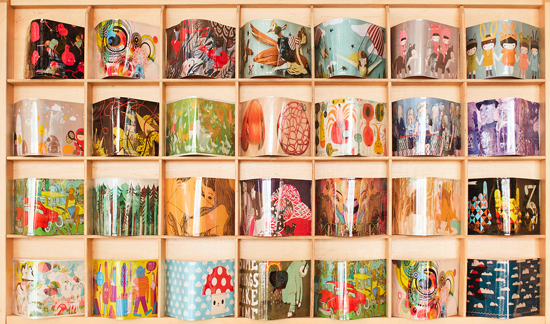 What caught my attention were these colorful vinyl wallets, each in its own space, hanging on the wall. These $20 wallets are what started Poketo’s ball rolling back in ’04. Now, emerging artists have a venue to show their limited-edition designs. 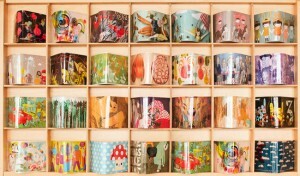 If you like Tokidoki, then check out the Motomaho wallet by Hideyasu Moto. UPO Wallet 2 shouts out bright hues in graphic triangular shapes. Comes with three credit-card slots, a bill slot and coin pocket. You may spot the iconic Poketo label at pop shops and galleries, even mainstream Target. Shoppers, take note of the upcoming fall and winter Asian arts and crafts scene that kicks off this weekend in NoCal. Artisans keep busy year-round preparing to sell their wares at these events. 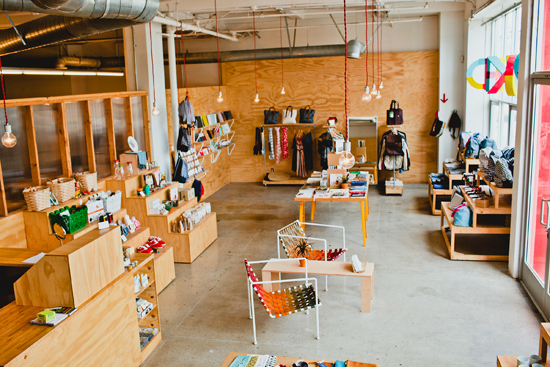 From the OC, LA and the South Bay, to central and NoCal, and up to Seattle, keen shoppers fill their baskets with great finds. One for me, one for the gift pile. Crafty and creative, with that Asian flair, this is what you get! Quality is key. Find the bling with way better than Nordstrom prices, wearables for everyone, clayworks, ornaments and stocking stuffers, interior accents, totes and lots of things paper. Take my dare IF this is new to you. Take your BFF along with you, chow later. Heard of some gals who fly distances just to shop! The first happening is this Saturday in Mountain View. Giving back is what the Midori Kai Arts and Crafts Boutique is about. Every two years, this non-profit made up of JA professional women selects worthy organizations for two-year grants. Current recipients are Asian Americans for Community Involvement, Japanese American Museum of San Jose, National JA Historical Society-Military Intelligence Service Historic Learning Center and Yu-Ai Kai Senior Services of San Jose. Sway with the hula students from Hula Halau O Kanela No’eau or listen to the ukulele sounds of Jason Arimoto while you shop. Noteworthy are Soo-Ling Chan’s jewelry pieces. 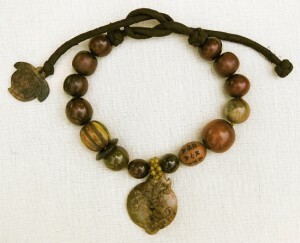 Handmade silk cords and leather strands complement various combos of gemstone and rock patterns for one-of-a-kind necklaces. Her statement pieces come mainly from China, Tibet, Thailand and Japan. Dragons dominate her current collection. One guess? This is the year of the prominent dragon! A jade dragon symbolizes security and protection from harm. Chan is influenced by a cultural heritage that dates back 32 generations, as well as a background in graphic design and modeling. With phone in hand, start keying in your holiday gift list now. Get that edge with an early start. And, may I suggest that you clip out this BIG list before The Rafu gets recycled. Saturday, Sept. 8, 9 a.m.-4 p.m.
Hawaiian-Style Pancake Breakfast 7-11 a.m.
Saturday, Nov. 10 10 a.m.-4 p.m.
Saturday, Dec. 1, 4-7 p.m. Thanks to Gail for a great job with her Krafty Korner news. northern and southern California, and other areas. If your love and interests are in the Asian inspired arts, clothing , jewelry etc…. this is a must see column to network. the people so helpful and friendly. Great customer base from this show.